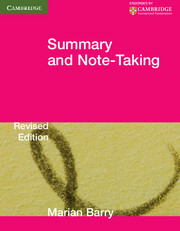 This popular book, endorsed by Cambridge, provides summary and note-taking practice for the revised syllabus of the Cambridge IGCSE examination in English as a Second Language. The exercises are also helpful for studies across the curriculum, and as preparation for the demands of academic writing. 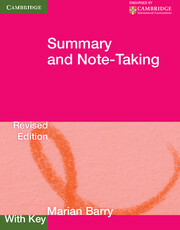 The Revised Edition includes linked summary exercises based on the preceding note-taking activities, and a Writing Tasks section containing topic-related writing tasks.